My mom loves Christmas, and she always has. She puts up four or five Christmas trees each year, and each tree has a theme. There’s a Santa Claus tree, a Candy Cane tree, a fruit tree, a tinsel tree, and a couple of other themes besides. She also watches the Hallmark Movie Channel frequently, and her radio this time of year is tuned to a local radio station that plays Christmas music 24/7 starting about the first of November. A few days after Thanksgiving, she had a question for me. “You know everything about Peanuts,” she said. “‘Christmas Time is Here,'” I replied. I have to admit that I almost said, “Christmas Time is Here Again,” the title of one of the Beatles’ Christmas fan club records. “Probably the instrumental version from the soundtrack album,” I said. She had no idea there were albums of Peanuts music. I have a half dozen, easily. I have some of Guaraldi’s original albums, some of the “cover” albums by other artists, an album of David Benoit’s Peanuts music. I think I’m covered on Peanuts music, really. I dug into my CD collection (which is mostly packed away in boxes) and found A Charlie Brown Christmas. I gave it to her; I have the album ripped to mp3s anyway. 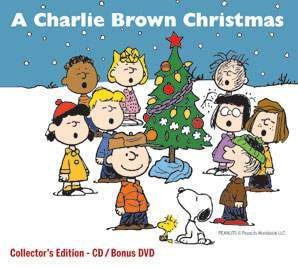 But then I was at Starbucks this morning, en route to work, and I saw that they had, for $12.99, a CD/DVD pack of A Charlie Brown Christmas — the original (not the remastered) album, plus a DVD of the animated special. This will come as a surprise, but I don’t have the animated special on DVD. The packaging is odd, and Peanuts scholars will see the immediate problem — the picture here is the cover to the Starbucks CD/DVD combo. Franklin? Not in the special. Marcie? Nope. Peppermint Patty? She’s definitely “Sir Not Appearing in This Program.” And while I’m pretty sure that’s supposed to be Linus on the front, when you open the package up it’s Rerun that you see in the same jacket, pants, and shoes, playing with Snoopy. Then, the cover to the liner notes feature the cover artwork from the DVD release of I Want a Dog for Christmas, Charlie Brown, which featured Rerun hugging Snoopy, and the artwork inside the booklet are three images of Rerun and Snoopy playing together based on I Want a Dog… Rerun, much as I adore him, also doesn’t feature in A Charlie Brown Christmas. Not long after I finish writing this, I’ll sit down and watch A Charlie Brown Christmas uncut, for the first time ever. (Okay, okay, even that “uncut” is inaccurate, as I doubt the DVD includes the original Coca-Cola advertisements.) But since I brought up I Want a Dog…, I want to muse upon that for a few moments. ABC showed I Want a Dog… last night, and it was the first time I’d seen it in several years, probably since it came out originally, come to think of it. I wrote a blog post about I Want a Dog… shortly before it came out, and I reread that post this morning on the train hoping, actually, that it had some insight into what I thought of it at the time. Sadly, I have no idea what I thought about it eight years ago. I mostly liked it last night. One of the reasons I love Rerun as a character is that, once he reached kindergarten, Rerun was totally mental. Rerun was a philosopher, and he had put together a philosophical system that explained the world in the way he thought it should function, except that the world didn’t work at all the way that Rerun thought it should. That’s where the humor in Rerun came from, in the collision between his sardonic philosophy and reality as reality punched a hole into the rarified clouds where Rerun’s head always was. When I Want a Dog… came out, I hadn’t read any of the 90s strips with Rerun since they were originally published, so they weren’t fresh in my mind. Now, I’ve read some of the late Peanuts in the last six months thanks to several collections, and what struck me with I Want a Dog… is how familiar the whole thing felt. It’s a “Rerun’s Greatest Hits” story — there’s Rerun dealing with his siblings, there’s Rerun joking with the Little Pigtailed Girl and getting suspending from school for harassment, there’s Rerun dealing with riding on the back of his mother’s bicycle, there’s Rerun playing with Snoopy. Nonetheless, it was still a great deal of fun, even if it was about one of Peanuts‘ minor characters.